Tony: Gibbs, I don't think Abby's heart cakes are edible. 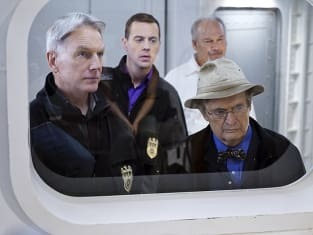 Gibbs: They're tofu, DiNozzo. You keep chewing. Permalink: They're tofu, DiNozzo. You keep chewing. Tony: Remember Max Headroom, Gibbs? Tony: From the 80s. Robot-head. Permalink: From the 80s. Robot-head. Grossman: Conveniently, I was born without empathy. With regard to Senior Chief De La Rosa's unfortunate passing, I reviewed the video and there was no proof he died of anything other the complications due to his own line of work. Secondly, even if there were foul play, there is no link between his death and our mission. Gibbs: What is your mission? Grossman: Our mission is classified. Permalink: Our mission is classified.